Starting tennis is easy. Just grab a racquet, head off to the local courts, and start playing. But starting competitive matchplay can be hard. There are so many different levels of leagues, tournaments, ranking points, ratings, venues, etc… then you have to find a partner… phew! It’s daunting. So this is our attempt at KWTA to make the process simpler and more understandable for those starting out. Below is a diagram of a typical term. Notice that it is broken up into distinct tournament and league sections. During the league window of weeks 2 – 7 there can be no tournaments played. This allows everyone to know that when they sign up for a league they are definitely not missing out on tournaments, therefore making the leagues stronger since everyone wants to join them. In the same way, players can enter tournaments knowing that it won’t interfere with their leagues. A tournament is an event that takes place over a small period of time (7 days is about the longest). Usually they are knock-out events where losing a match sends you out of the tournament (sometimes into a consolation tournament). Once you are out of the tournament you are done, and can go home. Except for the big events they are usually held at a single venue. What are the different levels of tournaments? Hot Shots Tournaments – Local events that take place over a single day. They offer no ranking points but are a great way to start playing matches. They usually offer Red, Orange and Green ball options. See your local club for details. Sydney Round Robins – Events held at various locations around Sydney. There are still no ranking points but they offer a great way to get exposure against players from different clubs. They offer Orange (8/U), Green (10/U) and Yellow ball (12/U, 14/U) events. Australian Junior Tour – These events usually have 12/U, 14/U, 16/U & sometimes 18/U draws. Large events will have a qualifying for unranked and lower-ranked players plus a main draw for the highest ranked players. Keep in mind qualifying rounds still have some great players, these events are TOUGH! These are the events you want to play to start building a ranking. There are 4 tiers of event (Bronze, Silver, Gold & Platinum) and each offers progressively higher amounts of points. Note: Rankings don’t determine your skill as a player, so don’t get obsessed with them or it can negatively impact your development. Australian Money Tournaments – These events are for any age group, they offer even more ranking points & they offer prize money. A league takes place over multiple weeks, and excluding some events at the Hot Shots level, they usually involve teams of 2 or more players. Each week players will try to win matches in order to gain competition points and get to the top of the ladder. At the end of the season the winner will either be the top team (first past the post) or the top teams will play a finals. These events offer no ranking points (although they do impact your rating), but they have a much more team centric atmosphere where players can experiment with their skills, knowing there will always be another match. This is where most of a player’s development will come from. What are the different levels of leagues? 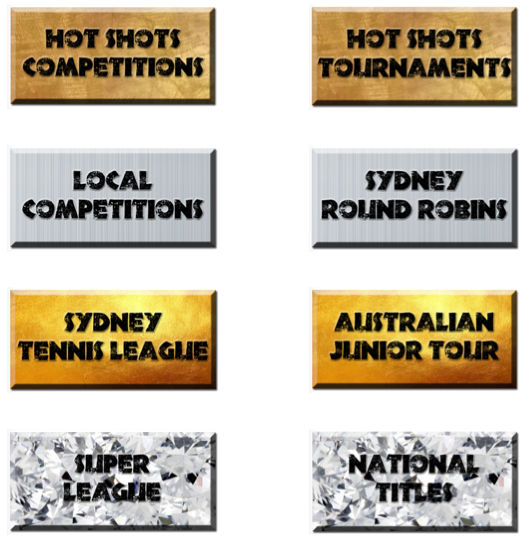 Hot Shots Leagues (Tier 4) – Local events that are a great way to start playing matches. They usually offer Red, Orange and Green ball options. Sydney Tennis League (Tier 2) – This is for the best players in any of the six regions in Sydney (We are North) to play on Sunday morning. Super League (Tier 1) – This is for the best players in NSW. Played at Sydney Olympic Park & Blacktown Tennis Centre, the top 24 players from each age group (10/U, 12/U, 14/U, & Opens) are picked to play against each other each Saturday. Each time you get far enough in a ranking points tournament (see above) you will earn points. NOTE: You must win a match to earn any points though. If you drop out of the tournament without winning a match you don’t get points. No, a BYE or walkover doesn’t count. Only your best 8 results in singles, and 6 results in doubles count. 12 months after earning points they drop off. This is called a rolling 12 month calendar and works the same as the ATP and WTA tours. There are currently 2000 girls and 4000 boys with rankings. They are not split up into age groups. (Yes, Samantha Stosur & Nick Kyrgios are on the same lists as these girls and boys. Seedings at tournaments will be based on rankings. The highest players will be seeded. Yes, rankings do impact selections for things like Super League, national training camps, interstate and overseas competitions but they aren’t the only things that is looked at. Relax! Focus on your skill, and the results will follow. It NEVER happens the other way around. A rating is a way of measuring a player’s skill level by comparing their results to that of other players. Basically, every time you play a match that is in a tournament OR league you will get an adjustment to your rating. If you did better than the system expected, your rating goes up. If you did worse, it goes down. Ratings are not currently being used in NSW, but they will go live shortly, and it should help in many aspects of competitive life. The best impact this will have is to make competitions easier to grade and even more meaningful. Once this goes live across Australia players (both juniors and adults) will have a way of describing their level more accurately than “I’m pretty good but not amazing.” More even competitions will lead to better matches and the skill level will increase for everyone.